This recipe was originally published as a guest post for Terri at Child of Nature Blog, and I love it so much that I'm sharing it again today! I've been following a gluten-free diet for over a year now (and I also used to be a vegetarian) so I'm no stranger to dietary restrictions. Many people have food sensitivities and allergies, and because of this I find it's good to have an arsenal of easily-modifiable and low-allergen recipes on hand for when you'll be feeding others. Most recipes are easy to modify to be both vegan and gluten free, but the staples of many American diets seem to center around meat and grains. It may take a little getting out of your comfort zone to prepare foods that are friendly to dietary restrictions, but sometimes that can be a very good thing. This easy recipe is free of wheat/gluten, meat, eggs, dairy, soy, corn, nuts, and almost any other allergenic food you can think of! One type of food which I feel is underutilized in American culture is beans (and other legumes). People seem to shy away from eating beans because of the potential gastrointestinal side effects, but beans are an excellent source of protein and fiber, especially when you're not consuming animal products. If you eat them on a regular basis, your digestive system will adjust to the extra fiber and and there will be no unpleasant side effects. What's more, they're very inexpensive, so they're great for families with a tight food budget. My favorite kind of bean is the garbanzo bean (also called the chickpea) which is a type of white bean. I greatly prefer the taste of home cooked chickpeas to the canned version, and cooking beans is very simple. I like to cook up a large batch and freeze them in smaller portions to use one at a time. I have a few tips for cooking dried chickpeas in my roasted garlic hummus recipe. A simple and delicious way to feature the chickpea is chana masala served over rice. I don't make any claims as to the authenticity of this recipe, but it is very tasty and also quick and easy to prepare. I referenced this recipe from vegweb.com, but I made a few modifications. I recommend preparing this in a cast iron skillet if you have one, to boost the amount of iron you'll get from the meal. Also, measuring is optional (I don't); it'll come out a little different each time, but it will still be delicious! Heat the oil in the skillet on medium high heat. Fry onions until translucent and lightly browned, then reduce the heat to medium. Add the garlic, curry, and tomato paste or sauce. Stir and simmer for a couple of minutes. Add chickpeas, lemon juice, salt, and black pepper and simmer 5-6 minutes, stirring occasionally. Add red pepper to taste. Stir and simmer for 5 minutes more or until dish is heated through. 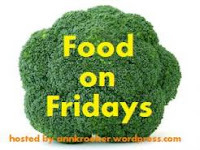 Linked up at Food on Fridays at Ann Kroeker, Friday Favorites at Simply Sweet Home, Fight Back Friday at Food Renegade, Slightly Indulgent Tuesday at Simply Sugar and Gluten-Free, and Food and Health Carnival at Lisa's Gluten-Free Advice and Healthy Living. Amy! I want to make this but wondering how much this makes, so I can alter the recipe for my housemates! Excellent! I'm so happy to hear that, and you're very welcome.